History, Characteristics, Japanese Ukiyo Artists, Hokusai, Hiroshige. NOTE: For more articles on the art and culture of Asia, please see: Asian Art (from 38,000 BCE onwards). The history of Ukiyo-e can be divided into two periods: the Edo period, which covers ukiyo-e from its origins in the 1620-30s until about 1867, when the Tokugawa Shogunate began to crumble; and the Meiji period, which lasted until 1912. If the Edo period provided a calm environment for the development of the art in a commercial form, the Meiji period led to more innovation as Japan opened up to the West. The two and a half centuries of peace presided over by the Tokugawa shoguns of Japan, during the Edo period (1603-1867) stimulated the growth of popular culture, and with it the art of Ukiyo (floating world). Ukiyo reflected the Buddhist credo that all is illusion, and during the Edo era it came to mean the pursuit of ephemeral pleasure. Woodblock printing enabled artists to reproduce large quantities of cheap images and triggered the mass circulation of Ukiyo-e. Suddenly art could be enjoyed by the general population as well as the ruling elite. In fact, woodblock printing had been used to mass-produce Buddhist religious texts and simple devotional images ever since the 8th century, but it wasn't until the early 16th century that illustrated books were printed. These ehon (purely picture books, as well as books with stories and picture illustrations) triggered a huge demand for all kinds of books as well as book illustration, and it was this that led to the large-scale production of Ukiyo prints. After the Meiji Restoration in 1868, Japan went through a westernization phase (bunmei-kaika) during which it opened up to imports from the West, including photography, which largely superceded Ukiyo-e during the period. Indeed, Ukiyo-e became so old-fashioned that the prints, now virtually worthless, were used as packaging materials. By then, however, large quantities of prints had been exported to Europe, where they rapidly became a source of inspiration for many modern artists, such as Van Gogh (1853-1890), Whistler (1834-1903), Claude Monet (1832-83), Edgar Degas (1834-1917), Mary Cassatt (1845-1926) and Toulouse-Lautrec (1864-1901). The great Jules Cheret (1836-1932), the father of French poster art was also influenced by Ukiyo-e woodblock prints from Japan. For important dates in the evolution of East Asian culture, see: Chinese Art Timeline (18,000 BCE - present). In line with its mass-appeal, Ukiyo focused on the ordinary things of life. Appreciated for its bright colour and decorativeness, its images frequently depicted a narrative, and included animals, birds and landscapes, as well as people from the lower social classes, like courtesans, sumo wrestlers and Kibuki actors. Its impact on French painting was due to the unique characteristics of Ukiyo-e, including its exaggerated foreshortening, asymmetry of design, areas of flat (unshaded) colour, and imaginative cropping of figures. Important early exponents of the genre included the popular illustrator Hishikawa Moronobu (16181694) and the innovative Torii Kiyomasu (a.1697-1722), who specialized in portraits of Kabuki actors (Yakusha-e). During the 1740s, the first type of polychrome prints (benizuri-e) were made, followed in the mid-1760s by full-colour brocade pictures (nishiki-e) pioneered by Suzuki Harunobu (17241770). The more realistic portrayal of women was spearheaded by Kitagawa Utamaro (c.1753-1806), who ushered in the golden age of Ukiyo, of the first half of the 19th century. Another of the greatest Japanese Ukiyo-e artists of the Edo period, was Katsushika Hokusai (1760-1849). Influenced by painters like Sesshu, as well as other Chinese painters, he is famous for his woodblock series entitled Thirty-six Views of Mount Fuji (1829-33, British Museum and elsewhere). 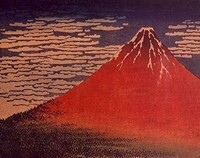 This series is exemplified by his two most famous woodblock prints, The Great Wave of Kanagawa (1830-2, Metropolitan Museum of Art, New York), and Mount Fuji in Clear Weather (c.1829, British Museum), which secured Hokusai's reputation both in Japan and abroad. Hokusai was a major influence on European painters, like Monet and Gauguin, who admired the bold simplicity of his designs and use of colour. The last of the great Japanese Ukiyo-e artists was Utagawa Hiroshige (1797-1858), also known as 'Ando' or 'Ichiyusai' Hiroshige. 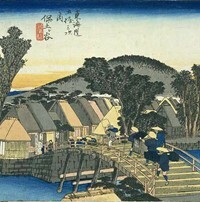 His most famous work was The 53 Stations of the Tokaido Series (1832-34, Tokyo National Museum). Despite the technical expertise of print masters like Suzuki Harunobu (17241770) and Ando Hiroshige (17971858), each print needed the co-operation of four experts: (1) artist, (2) engraver, (3) printer, (4) publisher. The print was usually initiated by the publisher, who was typically also a distributor or bookseller. He selected the theme and determined the quality required. The brief was then given to the artist to design, except that the quality of the finished product was heavily dependent on the skills of both the engraver, and the printer. Known in the West as xylography (from the Greek word 'xulon' for wood and 'graphikos' for writing), the actual design of a monochrome Ukiyo-e print was usually executed using the following procedure: The artist began by creating a master drawing in ink. A tracing (hanshita) of the drawing was then made on paper by the artist's assistant. The hanshita was then glued face-down onto a block of wood, by an engraver, and white areas of the paper were cut away. The drawing, in reverse, remained as a relief print on the block, which was then inked and printed, producing almost exact copies of the original master drawing. (The drawing could be drawn directly onto the block surface, after which the untouched areas would be removed with gouges, leaving the raised image which would then be inked.) Colour prints were made using a separate carved block for each colour. Several thousand copies of a print could be made until the engravings on the blocks became worn and flat. Japanese Ukiyo-e woodblock prints can be seen in several of the best art museums in Japan and around the globe, including the Tokyo National Museum; the Metropolitan Museum of Art, New York; and the British Museum.  For more about Japanese, Chinese and South-East Asian prints, see: Homepage.